Although we play on bigger and bigger screens and wireless gamepads work even from a distance of a dozen meters, we still have to sit with our noses in TVs in order to be able to enjoy the latest titles comfortably. All gamers raised with the third-generation consoles should remember that playing on those pieces of equipment was not a particularly comfortable experience. Short gamepad cables from the NES or Sega Master System often meant that instead of sitting comfortably on a sofa, we had to settle down on the floor just next to the TV screen. Luckily, with each next-generation equipment, the cables became longer, until we have finally moved to wireless gameplay in the era of PlayStation 3 and Xbox 360 – thereby, having fun from a sofa located even a few meters away from the TV became a reality. Then, with the eighth generation of consoles, we have returned to the starting point and again we spoil our eyesight by sitting too close to the screen due to extremely small font size in games which makes it impossible to read important content from a distance. You think it’s a joke? Not at all! The problem I'm writing about began to appear with the debut of the first consoles to display HD games – PS3 and Xbox 360. Earlier on, when TV sets had limitations due to CRT screens' low resolution, game developers were forced to create big subtitles in games, otherwise they would be dramatically blurred and unreadable. Thanks to this, playing on such console like PlayStation 2 was comfortable from any distance, and the only limitation was the length of a gamepad's cable. 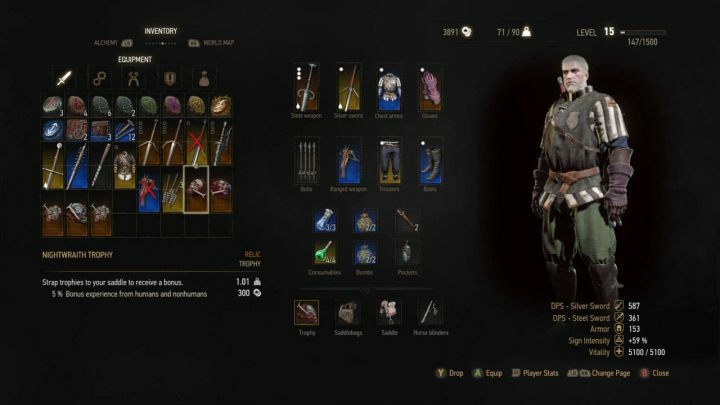 The inventory screen in the console version of The Witcher 3 is a real pain if you don’t have a large TV set. The era of High Definition has lifted the limits imposed by CRT screens, allowing much smaller subtitles to be placed in games, which the creators were very eager to use. However, since the third PlayStation and the second Xbox it quickly became apparent that the consoles don’t perform too well with real HD. The standard for most titles was HD Ready resolution, on which the font size was on a pretty acceptable level. The individual titles, whose authors managed to achieve this amazing 1080p resolution, were just too small a percentage of the whole industry to make the problem noticeable. The situation has changed with the arrival of the eighth generation of consoles. PlayStation 4 and Xbox One finally made 1080p a standard resolution. In addition to the much more detailed graphics, this meant one more thing – microscopic subtitles could be placed on the screen because they were not blurred at all and could be easily read. At the same time, however, a little detail has been omitted – not everyone prefers to treat their TV set as a monitor and play from a distance of a meter from the console. From longer distances, such as three meters away from the screen, microscopic fonts which have quickly become a new standard, turned out to be unreadable. The font sizes in latest Deus Ex game are sensible, but the magnifying glass is useful in cutscenes. The result is that even though my living room was furnished in such a way that my 40” TV set was located in front of a sofa, two and a half meters away – such setting is not suitable for playing. While Netflix or movies from the online VOD players can be viewed in a cozy lying down position without a single problem (enjoying a well-arranged subtitling), I had to push an extra pouf between the TV and the sofa, basically underneath the TV, because only then I was able to see everything without any difficulties. Something is definitely not right here. This problem concerns a huge number of games. As an example, it can be felt very strongly in The Witcher 3, where even if we play without subtitles, we are still doomed to texts used in the user interface that are literally impossible to read from a greater distance. 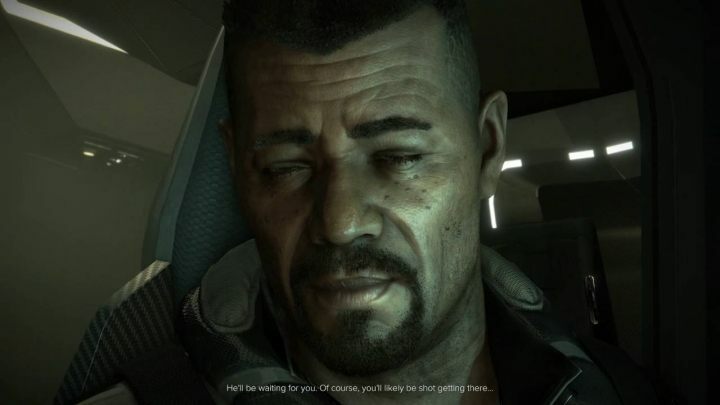 The newest Deus Ex is also an interesting case – if the subtitles are moderately bearable during gameplay in Mankind Divided itself, they become much smaller during cutscenes for some unknown reason. There are many more examples: Wolfenstein II: The New Colossus, Star Wars Battlefront II, Get Even, Mass Effect: Andromeda, Warframe, The Division and Grand Theft Auto V – just to name a few. Unless we have an enormous, gigantic, humongous, and massive TV screens of over sixty inches, playing in a comfy position on a sofa located at the opposite end of the room is in those cases very uncomfortable. 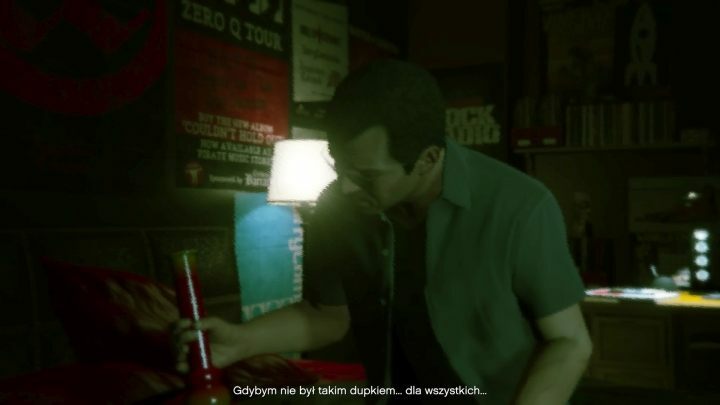 Even Rockstar couldn’t avoid this kind of issue – although in this case, the subtitles for the spoken text are not so tragic, the user interface and map markings are a much bigger problem. What is the actual reason for such an approach on the developers’ side of things? I have the impression that, to a large extent, there is a lack of imagination – when designing an interface, one simply forgets about the existence of twenty-, thirty- or forty-inch medium-sized TVs, focusing on maximizing the experience on much larger receivers. Artists, who are often passionate players themselves, may not even think that some of the players will want to play their games from a comfortable sofa rather than the “usual” position – from a chair slipped strictly under the screen. This is especially true to games made primarily for PC that were later ported on console platforms – there are no issues with a smaller font when you are playing in front of the monitor because the player is located right next to the screen by default. The reason for the maximum reduction of font size is also the desire to take care of game’s immersion. In theory, the less of the screen is being covered by text, the less it disturbs players in their perception of a particular production. In practice, the effect often turns out to be the opposite of that intended, as small subtitles force us to focus more on reading the descriptions than admiring the surroundings and vistas within the game. This issue is especially irritating when the small size is associated with a scourge of other mistakes, which have long since became unacceptable – too long subtitling lines, for example, with a large amount of text or poor line division, or even poorly balanced contrast between the background and the text (it’s not only a plague of subtitling in games, but also in the user interface of the consoles themselves, which was surely seen by anyone who likes to regularly change the graphical theme of their gaming rig from time to time). 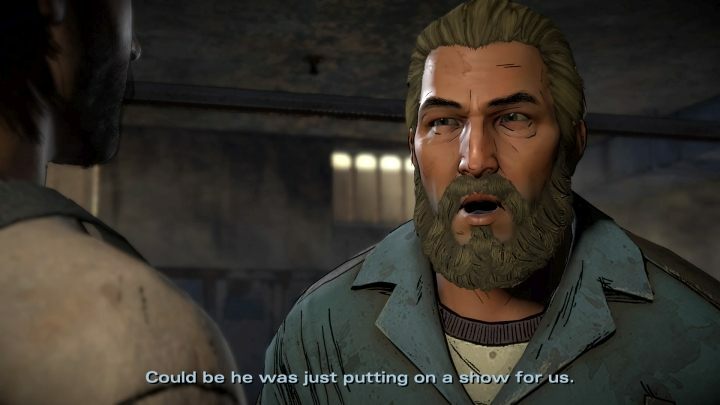 Telltale Games might have lessened their development power in recent years, but at least the subtitles in their games are professional and resizable. I must pay some respect for the glorious exceptions. The titles of Telltale Games studios, with all their disadvantages, offer the subtitle size adjustment option, so that the individual interactive series of this developer can be enjoyed comfortably without the need to "enter" the screen or decide to buy a colossal TV set. If the same option had been a standard in other titles, the problem would not exist and this article would be a history. Unfortunately, I don’t think that we can expect any improvements in this aspect. Actually, over time this can only get worse in result of the 4K resolution, which will probably become a new standard with the next generation of equipment. This will give the creators the opportunity to decrease the size of subtitles even further. Well, I won’t be surprised if they use it eagerly. People who, in addition to using dubbing, like to explore the story with texts, are facing bad times. At least until game developers take lessons from the filmmakers on how to make a neat set of subtitles. The article published on MD-Subs was very helpful in the creation of this piece. The author of that text has thoroughly analyzed all mistakes made in 2017 by authors of subtitles for video games.